The very mention of the snowhole conjures up images of vast caverns, replete with benches and table hewn from the frozen snow. Recesses carved into the walls house flickering candles, the light from which illuminates jolly adventurers as they relax on the snow furniture, perhaps playing cards, or smoking pipes in the manner of early polar explorers. From time to time one might prise oneself away from these warm and convivial surroundings and step outside to be greeted by a panorama of snowpeaks glittering in the moonlight, the stars twinkling above and the northern lights tickling the horizon. Snowholing was, it seemed to me, the way forward. There could be no more aesthetic and satisfying way to experience the winter mountains. The late winter snows fell particularly heavily in the Northern Cairngorms, providing the best skitouring of recent years. Eager to take full advantage of the conditions, we affixed climbing skins and made tracks on deep snow from the Cairngorm ski carpark. The day was still and crisp, the higher ground obscured by a thin veil of cloud. Before us lay a blanket of pure white, untarnished by rock or heather. We traversed below the Northern Coires, up Lurcher’s Gully and onto the high plateau beyond. Our outline itinerary was to ski across the plateau to Ben Macdui, where we were confident of finding a suitable site to dig in for the night. We might explore further before turning in. In truth we had no fixed plan to stifle or constrain us. Our snow shovels made nomads of us, granting us the freedom of this white wilderness. The cloud cover necessitated the use of map and compass from the outset. We had hoped that occasional breaks in the cloud would allow us to verify our position, but this was not to be the case. I was unperturbed, having previously navigated across to Macdui and down the Tailor’s burn to the Lairig Ghru in similar conditions. Every member of the party was a veteran of the Cairngorm whiteout. I soon realised that my previous experience had been in a milder whiteout than the current example. The unusually complete snow cover meant that there were no objects of any description to aid orientation, not even the slightest trace of a rock protruding through the snow. The cloud cover was very light, enclosing us within a bubble of tremendous brilliance, the sun’s rays reflecting off the snow below and scattering off the mist all around. Even on ski, gradients were difficult to discern. A drop even a few feet in front would have been invisible to us. Soon we were reduced to throwing a biscuit, appropriately enough a Penguin biscuit, in front to the limit of visibility at around 20 feet. We would then shuffle up to the biscuit before repeating the exercise. At Feithe Bhuidhe, the shallow bealach between Cairngorm and Macdui, the clouds parted for the one and only time that day. A brief glimpse of Loch Avon confirmed the accuracy of our navigation. It was clear that our progress had been so pathetically slow that we had little chance of making it across the plateau to Macdui. We took a bearing for Coire Domhain in search of steeper, more hospitable terrain. Once in the coire we paced about in all directions in search of a suitable snowhole site. Frustratingly flat ground lay all around. We confabulated frequently but indecisively. Our world of limitless possibilities shrank to but two options in the fading light. Firstly, we could negotiate our way back to the cars. Secondly, we could systematically explore the surrounding whiteness until found somewhere to dig in. Our inability to locate the steep slopes depicted on the map had cast some doubt on the accuracy of our navigation. This uncertainty made us reluctant to pursue the former option, for precise mapwork would be required were the cliffs of the northern coires to be avoided. 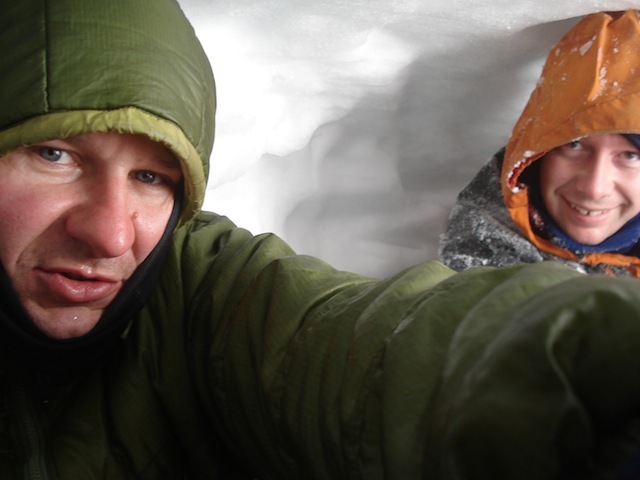 In the gathering dusk I plunged the three metre long avalanche probe into the snowpack. It didn’t reach the bottom and the decision was made. We unpacked our shovels and started to dig. The blade of my shovel rasped as it glanced off the surface of the hard, icy snow. Slowly but surely reality displaced my romantic dream of snowholing. Each and every shovelful had to be hewn from the snowpack by hacking with full force. We worked in shifts, digging until fatigue set in, then resting until the gripping cold made us beg for another stint at the coalface. By the time night fell we had excavated a small burrow and were in the process of enlarging it to either side. With darkness came wind and with wind came stinging spindrift. Two full hours of frenzied digging won us a hole that was wide enough for us to lie side by side and just tall enough to sit up in. The intensifying storm and plummeting temperature increased the appeal of our humble refuge and we availed ourselves of its shelter, blocking up the entrance as best we could with our skis. We sated our appetites with hot food before settling into our sleeping bags. The hole was big enough for two people, but only just. I lay on the outside, closest to the door. We used our packs up to seal the remainder of the doorway. The hole was pleasantly warm, draught-free and surprisingly dry. With our essential tasks complete we were able to take stock of our situation. The sensation of being entombed in ice was inescapable. A small but steady and slightly disconcerting trickle of spindrift was pouring through the hole that remained above our packs at the top of the door. We speculated as to how this scenario was most likely to play out. Of the various outcomes we discussed, two emerged as clear favourites. On the one hand, the snow might completely seal the entrance, entombing us. On the other hand it may continue to dribble incessantly until our hole was completely full of snow. In the event of this second outcome we would be Encased rather than Entombed. We ruminated upon these possibilities. While neither option could be classed as ideal, any alternative course of action would involve being harried by ice-laden winds. We decided to wait in the comfort of our sleeping bags and let the night unfold. I had brought along a small plastic bottle of malt. Neither of us felt inclined to overindulge lest the situation required us to spring into action and extricate ourselves at short notice. The humour of the situation was not lost on us and we joked that we truly were living the dream, snowholing high in the Cairngorms. Despite our laughter we had both begun to consider the fact that both of the scenarios we anticipated – Encasement and Entombment – were tinged with the possibility of asphyxiation. The question on our minds was whether or not this fear was irrational or perfectly rational. It was a rather small hole, but, for the time being at least, it was open to the atmosphere. Surely the snowpack would be porous to some extent, allowing some exchange of air? Ice, however, is most definitely not porous and our aching hands were a testament to the iciness of the surroundings. We concluded that if it is possible to asphyxiate in an unventilated tent it must be possible to asphyxiate in a snowhole. The only question was how long it would take. Remembering that the presence of air pockets allow shipwrecked mariners to survive for many hours in upturned boats, we satisfied ourselves that our fear of asphyxiation during Entombment was indeed an irrational one. We turned our attention to the incessant trickle of snow which had, by now, filled up a good portion of the doorway. Just how great was the risk of asphyxiation during Encasement? While we had drawn comfort from the analogy of the shipwreck survivor, that of the avalanche victim filled us with unease. There was no doubt that, should we be become completely Encased, asphyxiation was the likely outcome. It seemed implausible, however, that we could become buried to the point of Encasement without waking up, spluttering and coughing the snow from our facial orifices. Fear suppressed, we extinguished our torches and settled back. The darkness was absolute and we soon drifted off. When I awoke after an hour or so I was greeted by an enormous snowball that reached almost to the ceiling of the snowhole. It extended across my sleeping bag, pinning my legs to the floor and hiding Mearnsey completely from view. I looked at the huge mound of snow and realised that where a few short hours before there had been a two and a half foot wide entrance, skis, packs, stoves and cooking equipment, there was now only snow. Still it trickled in, pitter-pattering ceaselessly onto my sleeping bag cover. My partially buried state compelled me to address the snow problem. Mearnsey huddled smugly in his bag, pressing himself up against the walls to make room as I freed my legs, pulled on my belay jacket and prepared for work. The shear volume of snow obliged me to shovel first into the interior of the hole. Having created sufficient room to break through to the outside, I climbed briefly into the maelstrom and shovelled away as much snow as possible before hurrying back to the sanctuary of our temporarily reclaimed hole. We compromised on 45 minutes, but I didn’t set my watch properly and over two hours elapsed before we woke again. The ingress of snow was similar to the previous occasion. I settled back smugly and watched as Mearnsey did the business. It was now clear that we would make it through the night without becoming Encased. We relaxed and slept until the coming of the dawn light rendered our situation intolerably claustrophobic. We were completely Entombed. With Mearnsey having taken the last turn on the shovel it fell to me to break the seal. I scraped a tunnel through the snow until daylight shone in. Steeling myself, I shoved my head towards the light. To my surprise and dismay, instead of breaking through, my head became embedded in snow. I lurched, spluttering, back into the hole. Further tunnelling revealed a brilliant light but again my thrusting head met only snow. My third attempt revealed poor conditions – windy, cold and with little in the way of visibility. After breakfast we navigated back to the top of Lurcher’s Gully. The visibility improved, revealing the prospect of a splendid descent on untracked powder. The descent was indeed so splendid that we skinned back to the top and took a second bite, traversing this time all the way back to the ski car park. And so my first snowholing expedition came to an end. At the time I classified it as one of those experiences to which every self respecting mountaineer should subject themself at least once. Having done it once myself I vowed not to repeat the experience, at least not until I had forgotten just how unpleasant it was. The human mind is wonderfully selective in what it recalls and as I sit here writing this account, I am once again captivated by the romance of the snowhole and looking forward to breaking the turf on this year’s.